Your Windows 10 laptop is capable of making a wireless connection anywhere the Wi-Fi signal is available. You need to know the network’s name and its password. Upon success, your laptop can use the network and access the Internet without the burden of wires and other encumbrances. Avoid connecting to unknown networks in a public location. You’re taking a security risk when you don’t know exactly which network you’re using. Click the Wi-Fi notification icon. If you don’t see this icon, Wi-Fi network access isn’t available at your location. Click to choose a wireless network from the pop-up list. Place a check mark by the Connect Automatically option. This option ensures that the laptop automatically reconnects to the network whenever it’s in range. Type the network password and click the Next button. If you’re on a home or work network, click the Yes button; otherwise, click No. By clicking No, you add extra security to the connection. This is the choice to make for a public location, a café, the airport, and so on. Click Yes for your own, private network at home or at the office. Your laptop is now connected to the wireless network. By choosing the Connect Automatically option (refer to Step 3), you ensure that whenever your laptop is in range, it connects to, signs in to, and accesses that network. That way, you need to configure the network only once. For security reasons, some wireless networks don’t broadcast their network names. Obviously, you cannot connect to a network if you don’t know its name, mostly because the unnamed network doesn’t even show up in the list of available networks. In Windows 10, press the Win+X key combination and choose Control Panel from the supersecret menu that pops up. From beneath the Network and Internet heading, click the View Network Status and Tasks link. The Network and Sharing Center window appears. Choose the link Set Up a New Connection or Network. Choose the Manually Connect to a Wireless Network option and click the Next button. 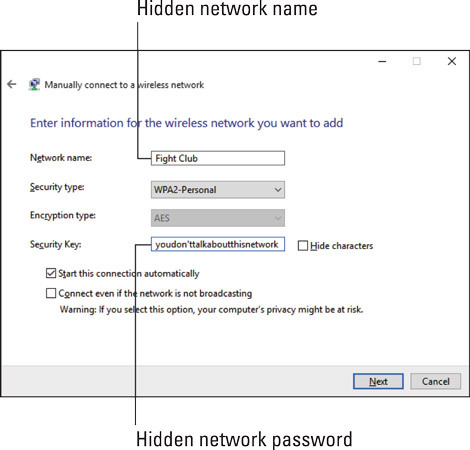 The nameless window for connecting to a hidden wireless network. Type the network name in the Network Name box. Fill in the rest of the information as needed. Check with the person who provided the network name for details on the network security and encryption. Ensure that a check mark is found in the box labeled Start This Connection Automatically. This step saves you some time by preventing you from having to repeat these steps later. Windows goes out and finds the unnamed wireless network. Choose the Connect To option. Surprise! You thought you were connecting to the network, but you were merely setting things up. You still must work through the connection process. The network name is referred to as the SSID, where SSID stands for Service Set IDentifier.